The average sofa sees a lot of daily use (and abuse) and it doesn’t take long for it to start looking tatty, which is obviously no way to complement the rest of a well-kept lounge room. 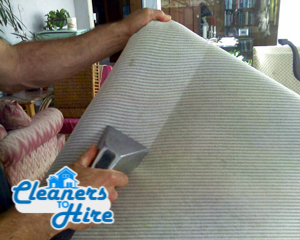 If the time has come to subject your upholstery to some serious cleaning by all means use our specialised service as opposed any homemade or randomly chosen treatments which are likely to damage the finish, leaving you with unplanned expenses to cover. The techniques and products we use are perfectly safe and suitable for all types of non-leather finish sofas. Our methods are quite effective in lifting and removal of stains (chemical and organic), but please be advised that stains which have been treated with random products or subject to homemade cleaning may have become permanent. The technicians will review the condition of the sofa set and determine the most effective yet sparing way to remove any staining. In most cases this means a combination of steaming and application of mild detergents which do not affect the visual or comfort properties of the furniture. Subjecting the upholstery to professional maintenance on a regular basis will keep it looking better for longer and prevent some of the mechanical wear and tear caused by conventional and aggressive cleaning treatments. On average, your upholstery should be subjected to disinfection at least once every six months. And since we have availability in all of London, booking will not be an issue. Our professional service is carried out by specially trained industry professionals, qualified in the safe and efficient use of steam equipment and industry formulated products. All necessary precautions will be taken to prevent damages. Depending on the type of finish, the process might be completed by application of conditioner which leaves the material soft and fresh. Please be advised that steam cleaning uses water, which means the sofa will be somewhat damp after the service is completed. In general, the drying time gravitates between one and three hours depending on ambient temperature and relative humidity inside the premises. Airing out the room usually helps reduce drying time. This type of cleaning is available separately or in combination with any other service we have in store.